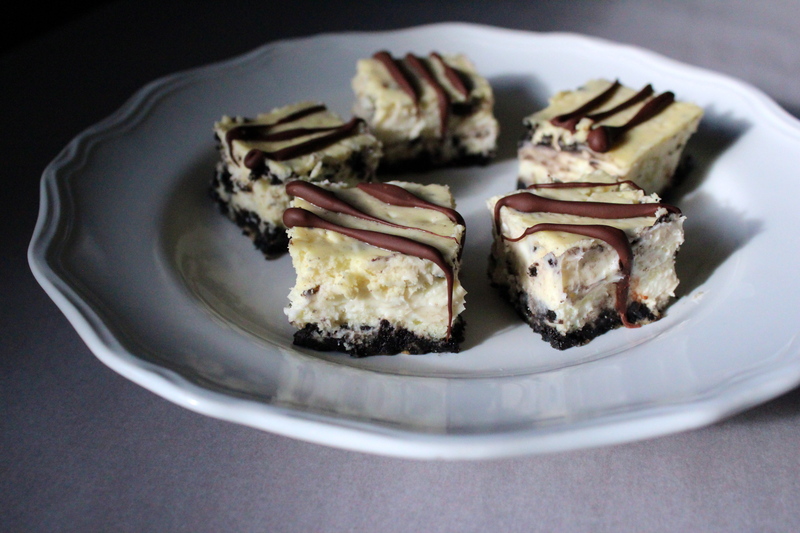 Happiness Project Recipe #23: Cookies & Cream Cheesecake! Oh cheesecake! Oreo. Cheesecake. The best of both worlds combined into one tasty, decadent bite! During my 1st trimester, one of my daily cravings was the single serving vanilla cheesecake from Jack In The Box. A craving which I couldn’t help but indulge in far more often than what was technically considered healthy. So even now at 31 weeks, it’s no surprise that I’ve once again become a wee bit obsessed with this one particular dessert. Hence this new, very fun recipe. With Oreos. Did I mention Oreos? *wink* The ONLY downside to this yummy, drizzled concoction? These little niblets are almost too decadent for single mass consumption. Trust me. I know. Don’t believe me? Try these. I dare you. Preheat your oven to 325F. Line a 9×13 inch baking pan with aluminum foil, leaving enough side foil to hang over the edges of the pan. Finely crush up 24 Oreos for the crumb bottom. Melt the butter in a microwave safe bowl and then mix well with the crushed Oreos. Press the mixture onto the bottom of the pan. Yes, this will be quite sticky so have patience while gently and firmly pressing out the entire mixture, making sure to create nicely formed edges at each corner. For the cheesecake batter, using a large bowl on a stand mixer, beat the cream cheese and sugar until fully incorporated. Blend in the sour cream and vanilla. Add the eggs, one at a time, scraping down the sides of the bowl with a spatula after each addition. Roughly crush or chop up the remaining 12 Oreo cookies and gently fold them into the batter. Now pour the batter over the cookie crust. Bake the cheesecake for 35-40 minutes, until the edges are firmly set and the center is nearly fully set. Cool on a wire rack for at least 1 hour before covering with plastic wrap and chilling in the fridge for 2-1/2 to 3 hours. Once the cheesecake is sufficiently chilled, take the cheesecake from the fridge and remove from the pan, using the foil overhang. Using a small pairing knife, cut up the cheesecake into whatever desired sized pieces you want. Set the cut pieces onto a parchment or Silpat lined baking sheet: you might get a wee bit messy with the chocolate drizzle. For the drizzle, heat up the chocolate chips in a microwave safe bowl until fully melted. Using either a pastry bag with a small, round decorating tip or a Ziploc bag (sniped at the bottom corner), pour the chocolate into the bag and drizzle as much or as little onto the cheesecake pieces as your hungry heart desires. If not serving immediately, cover with plastic wrap and chill in the fridge until ready for consumption. Mass consumption. Party-worthy consumption. Your friends and family will worship you forever for this! « Happiness Project Recipe #22: Classic Crumb Coffeecake! Those look incredibly delicious! Thanks for sharing the recipe. Yum that looks delicious!! Thanks for the recipe! That drizzle looks perfect! Sounds so yummy. Thanks for sharing this recipe – looks delish! This Cookies and Cream Cheesecake looks so delicious! I’m definitely going to make this to serve at an upcoming party. Gosh this sounds like the perfect indulgent weekend treat! Or better yet, I might put in a request to my husband to make this for my upcoming birthday! I’ve never cooked or baked with Oreo’s before. I really have to give them a try. Yummmm these look so good! Really. I need them.